OEM Style Keyless Entry system with built in relay for Parking Light Flash. Door Lock/Unlock outputs, 2-Stage Unlock, Aux output, Starter Disable (Optional), 2 - 4 button OEM Style Remotes. 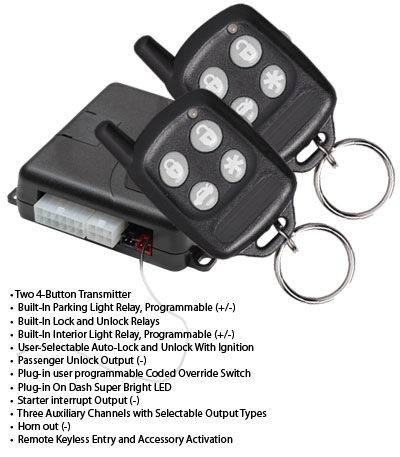 Control your vehicles door locks by remote with the Commando KE-30-I Full Keyless Entry System with Starter Disable. • Two OEM Style 4 Button Multi-Channel Transmitters. • Remote Auxiliary Channel For Keyless Trunk Release, Power Window Control, Etc. When purchasing the Commando KE-40-I Keyless Entry w/Starter Kill, consider the other items listed below. You can add all desired items from below at one time by clicking the Suggested Items Add Page link.